One of the most common arguments against maximum harm-reduction advocacy is: "But we're already winning! Veganism is surging in popularity, and everyone is interested in being vegan!" For anyone actually concerned with helping animals in the real world (including myself), a reality check is often helpful. 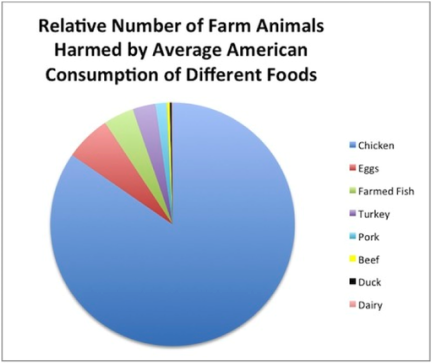 This new analysis, Americans Love Their Meat, provides the latest sobering reality. "Last year, per capita meat consumption in the U.S. increased at the fastest rate in four decades, climbing 5% compared with a year prior." ...please join and support groups like One Step For Animals whose advocacy is not driven by ideology, but dedicated to real world results. Well said Matt. It's not about the vegan bubble, it's simply about the animals. It's great to see veganism become more mainstream every year but if we want to help reduce suffering and effectively help, then staying in the vegan echo chambers is not particularly helpful. That would be ideal Heather. Yet 20 years and hundreds of millions of dollars later, we have not increased the percentage of people who are vegetarian or vegan. Paying attention to that negative data as well as the way most people change their behavior, incrementally, a good harm reduction effort seems to be in order.